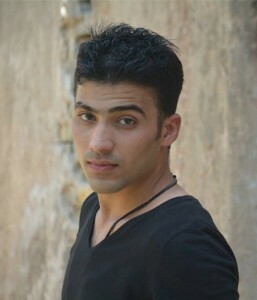 Battery Dance mourns the loss of its beloved Iraqi protégé Adel Euro, a dancer, choreographer, rapper, filmmaker, coach and all-around extraordinary human being. In the aftermath of the Baghdad bombing that took the lives of 292 innocent people who were out shopping for the Eid-al-Fitr marking the end of the observance of Ramadan, Adel’s story has been touching people worldwide. We first encountered Adel in October, 2014. A conversation ensued that led to trainings on Skype between our studio in New York and his living room in Baghdad. Invitations from the Amman Contemporary Dance Festival and the Amman Jazz Festival in April, 2015, presented us with the opportunity to travel to Jordan and to facilitate Adel’s meeting us there. In his first-ever professional-level dance experiences, he performed a solo, and perfected ensemble choreography with veteran Battery Dance performers Sean Scantlebury and Mira Cook with live musical accompaniment. The environment in which Adel worked in Baghdad was fraught with danger; from random acts of violence (he just missed two earlier explosions) and from the stigma of being a man who dances. But nothing could deter his spirit and drive. He persisted with his mission of becoming a great performer, a unique creative artist, a trainer and an inspiration for the next generation of dancers in Iraq. He even dreamed of starting a charity to support children whose parents had been killed in the on-going Middle East conflicts.